American hardwoods are an environmentally responsible interior finish building material. From selection harvesting, forest acreage growth to renewability and animal habitat formation, American hardwood lumber is one of the best material choices that can be made by the design community. Environmental responsibility goes beyond sustainability, however. Looking at hardwood as a construction material and its impact on the environment, it is a very attractive option compared to other building materials. Unlike most other building materials, as hardwood trees grow, they are actively pulling carbon from the environment while producing oxygen. This sequestration of carbon is a long-term effect that locks away that carbon permanently. Over half the weight of a kiln-dried American hardwood board is captured carbon. According to the U.S. Environmental Protection Agency, it is estimated that each year U.S. forests remove the greenhouse gases emitted by 139 million cars, or about 13 tons of dust and gas per acre. Wood represents 47 percent of all raw materials used in the U.S., but the energy used to produce wood products accounts for just 4 percent of the energy used to make all manufactured materials. Products like steel, aluminum, concrete, glass and synthetics require significantly more energy to produce, install and dispose of at the end of their natural life cycles as compared to American hardwoods. 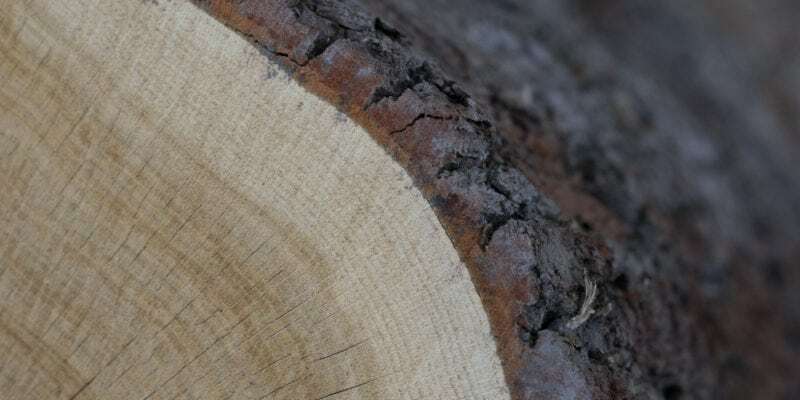 Wood removes carbon dioxide from the environment, requires less energy to process and manufacture, and has a much smaller carbon footprint than many other resources. No one material is perfect in all applications. When wood is used, it has some distinct environmental advantages over other common materials like steel and concrete. Steel usage, for example, releases 24 percent more pollutants into the air and 34 percent more greenhouse gases than wood. Concrete usage requires 57 percent more energy consumption, causes 81 percent more greenhouse gas emission and 350 percent more water pollution than wood. Replacing 1 cubic meter of concrete with 1 cubic meter of wood saves approximately one ton of CO2. Keep in mind that the United States controls approximately 9% of the world’s hardwood resource, satisfies more than 25% of the world’s appetite for hardwoods in furniture, flooring and joinery and there is more than twice the volume of hardwood growing in the United States as compared to 50 years ago. Criswell is the Architectural Marketing Manager for Frank Miller Lumber and represents them to architects and designers around the world. Criswell has been in the hardwood business for 30 years and has represented Frank Miller Lumber for 22 years. He has served on the Board of Directors for the Wood Products Manufacturers Association, the Western Hardwood Association and the Hardwood Federation PAC in Washington D.C. Criswell is a cancer survivor and now serves on the Patient Advisory Council for a new Kettering Cancer Treatment hospital in Kettering, Ohio.